Project: CAPSyS (Systems Medicine of Community Acquired Pneumonia) is a consortium with the aim to investigate and better understand the course of pneumonia from infection to resolution. The research will be done in five sub projects at seven locations, with support by external partners. The consortium is funded by the Federal Ministry of Education and Research (BMBF) with 3.8 million euros. CAPSyS particularly focus on a severe course of disease, which may involve loss of barrier function between alveoli and blood stream and may lead to spread of infection beyond the lung (sepsis, Figure 1). In consequence, the initially localized response of the immune system may also become systemic and may even contribute to further deterioration of patient’s health, possibly leading to failure of the lung and of other vital organs. With its high incidence and potentially severe course, pneumonia is an important cause of death and one of the great medical challenges today. The CAPSyS consortium aims to apply a systems medicine approach to identify new molecular and clinical signatures predicting imminent lung barrier failure in patients with hospitalized, community acquired pneumonia (CAP) and to generate new insights into relevant pathomechanisms. CAPSyS draws on the resources of three large German study groups, PROGRESS, CAPNETZ, and SEPNET, which provide data and materials from biobanks. For instance, within PROGRESS, clinical data and biological materials from a large number of patients with CAP have been collected in a prospective manner and numerous molecular measurements have been performed, with results available to CAPSyS. The consortium combines particular strengths of partners with clinical expertise, a track record of successful clinical studies, extensive experimental know-how, and with many years of experience in mathematical modeling of biological systems as a basis for the systems medicine approach. 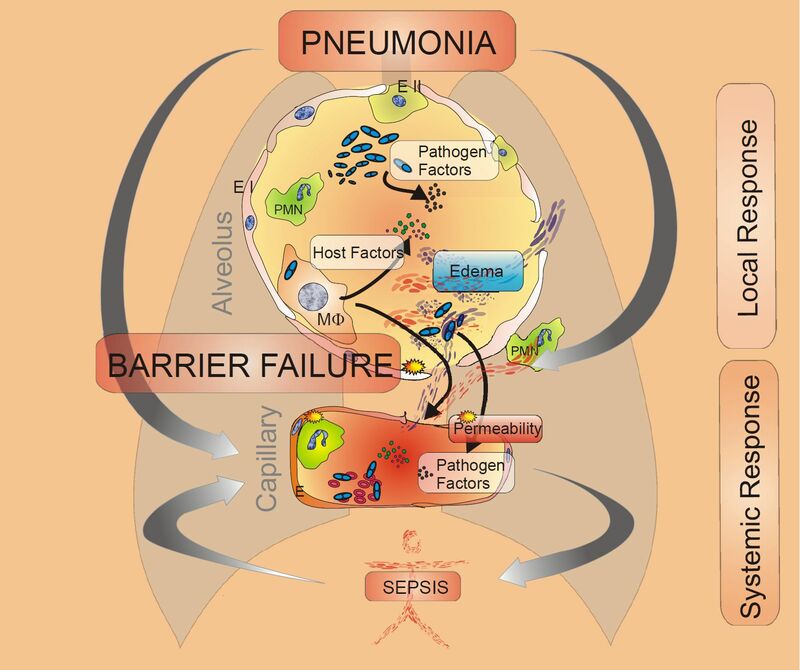 The interplay between mathematical modeling, verification of results in laboratory experiments, and detailed patient characterization leads to a better understanding of barrier failure in pneumonia. This in turn is incorporated into new mathematical models. This feedback-loop is at the heart of the systems medicine approach which will be followed in five sub projects at seven locations, with support by external partners.